Category: Promotional Products. Sub Category: Travel Mugs & Bottles. 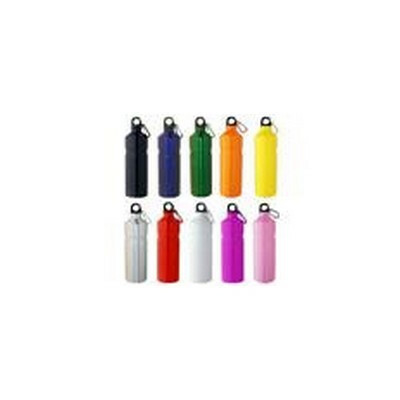 Features: Strong and lightweight aluminium sports bottle with hiking lid and carabiner. Aluminium. Packaging: Plastic bag + White box. BPA Free. Capacity: 750ml. Product size: 72mm x 250mm. Decoration option: Pad print, Screen print, Laser engrave, Heat transfer. Printing Size: 35mm x 45 mm. Laser Engraving Size: 30mm x 45 mm. Carton Size(CM): 48x33x28. Carton Weight(KG): 5. Carton Quantity: 24. Colours: Yellow, White, Silver, Red, Purple, Pink, Orange, Green, Blue, Black.